I decided that weekly updates for the whole summer would become repetitive and boring, so for the first few weeks, updates were posted. From now on I might do them every two weeks or at the end of the next month and then a whole summer wrap up when I travel home. Because this is not exactly a holiday, I don’t do something fun and crazy and exciting every single day. I am here for the summer, to enjoy myself but to also work and although I currently don’t have any jobs, I saved up enough, and worked for a little bit, to be surviving just fine and enjoying myself which is great. It does induce some anxiety I will admit. It’s hard to explain to people who don’t suffer from anxiety, how crippling it can be. I get so anxious and stressed out about jobs and ultimately running out of money that it brings my mood down, I get irritable and it de-motivates from even looking for work, it’s a vicious cycle. In my mind, I have a job waiting for me at home so why sit around in Berlin not earning money when I could be at home earning money all summer. It’s not about that, even if I don’t find a job here and survive on the money I’ve brought with me, I’m not going to run home at the first sign of trouble, halfway through the summer, just because things get difficult. The only way I’m going home early is if it is absolutely necessary financially, which I hope it doesn’t come to. In the first month here I have had an amazing time, we’ve explored, gone on some nights out and I have really broadened myself culturally in my opinion. 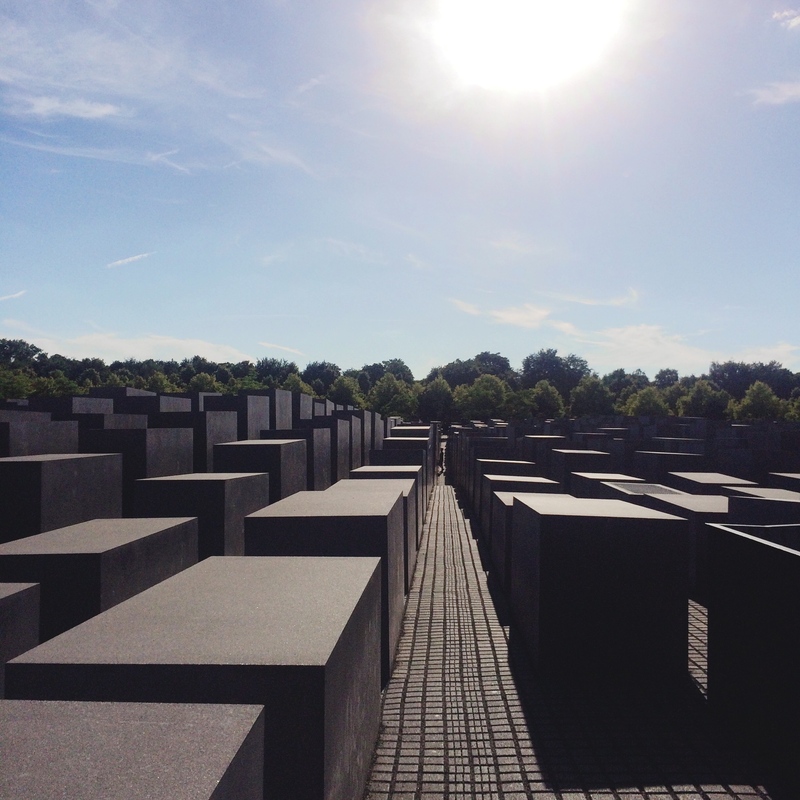 This past week we went to see the Holocaust Memorial which is beautiful and sad in it’s own way, I think it is a great way to acknowledge it and the information centre underneath it that I had no clue existed, gives you a history of the Holocaust and it it very interesting. A lot of the information I had heard before as it is a subject I have always been interested in, we studied it a lot in school but even though I knew some of it, it was still very interesting to see and experience in a country that some of it happened, it is a completely different experience. Afterwards we went on a search for a juice bar, which we could not find. I’m not sure if it isn’t really popular here or we just looked in the wrong places, but in the end we bought bottled juice from Aldi, it was still good but we would have preferred fresh juice. With our juice we went to Tempelhof, sat and chatted while enjoying the nice weather. It was a really fun and relaxing day overall, which is the reason I came to Berlin. It is very easy to allow yourself to get down about things not working out and for me to let my anxiety take over and ruin my day, but it’s days like that, that remind me to have a fun time even when life isn’t working out, because you will look back and regret ruining your experience by not fully taking it in and enjoying yourself. So while I still search for work, I will be trying to post more frequently on the blog, whether that happens, we’ll have to see. But overall I am thoroughly enjoying my time in Berlin, the city is amazing, it is somewhere I will forever recommend to anyone who wants to explore Europe, it has such a rich history and it’s amazing to learn more about it in person and not from a textbook or a computer screen. Hope you guys enjoyed reading this honest wrap up of my first month in Berlin, I don’t want to sugarcoat it and pretend it hasn’t been challenging, it definitely has but it has pushed me to look at the bright side of things even when life is not going my way!